I met the good folk with the TrueFire in their heart (Brad, Ali, Ren and Jeff) at NAMM in January. Two of their educators who I have played with introduced me to them and recommended me. So we talked on the phone after the hustle and bustle of NAMM. They liked my ideas for courses and we miraculously could work out the scheduling for the shoot which is always done at TrueFire Headquarters in St. Pete. I spent the better part of February and March putting the concepts of my material into video format and prepared many diagrams and charts to accompany them. Organization and coordination was made easier by TrueFire’s streamlined systems to help in that process. In April they flew me out to Florida to record. They treated me like a total rock star, green M’nMs and all. And I even got a fruit and veggie plate and awesome vegan dinner. If you know me, you know that is the way straight to my heart right there. We recorded 47 videos in those two days. I slept well after that 😉 . Producer Tommy and editor Adam made it all very easy, even though it was just a lot of material to cover. Ali shot the awesome photos of me you see all over this blog and on my book. We really worked on those colors, too, I even had Gerald Marleaux spray paint the body of my Votan Marleaux XS in seafoam green. All my basses have names, so this one is now called TrueFire Surf! I enjoyed being back in Florida, which is after all my old stomping grounds when I came to the US to study Jazz at UM. Great times! Editing and post production for Pentatonic Playground for Bass took another few months. So much material comes with this course – lots of diagrams, charts and TAB, even GuitarPro files! Wolf made 20 awesome jam tracks for me and we adapted them for download. TrueFire made it look fabulous on their website and on the DVD! For the knowledge-thirsty, groove-hungry bassist it is all there – easily accessible and clearly laid out. Pentatonics are such a useful tool – if they are being used effectively. As my students know I like teaching in a systematic way, so I start with the basics of the who-what-when and why. Then I lay it out on the fretboard, with features, technical exercises, groove samples in various musical styles relevant for today’s bass player and lots of creative exercises. Then it is all about applications, transposing, using the material in creative ways. Here is the course description for Pentatonic Playground for Bass from the TrueFire webpage. I am super happy with how it turned out. Check it out, leave a comment, let me know how it is working for you. pentatonic scale. Then in section two, Ariane shows you five patterns: Pattern 1: The Hexagon, Pattern 2: The Boot, Pattern 3: Big Box, Little Box, Pattern 5: Little Box/Big Box and Pattern 6: Upside Down Boot (no typo here there is no Pattern 4 and you’ll learn why in the course). For each position, you’ll learn key features, exercises to get your kinesthetic memory in gear, a creative groove-and-fill exercise, and a featured bass line that maximizes the characteristic potential of each position. In the third and final section, everything you learned in the previous sections will be put to work as you play your way through 12 Application Studies: 5 Patterns Workout: Major, 5 Patterns Workout: Minor, Horizontal Connections, Diagonal Connections, Fills with Fourths and Fifths, Single String Fingerings, Transposing Into All 12 Keys, Chord Qualities & Pentatonics, Pentatonics & The Blues, Soloing: Minor Pentatonics, Soloing: Major Pentatonics, and Playing Progressions. Ariane demonstrates over rhythm tracks and breaks it all down by stepping you through the key concepts, techniques and creative approaches she uses in the Application Studies. All of the key examples and performances are tabbed and notated for your practice, reference and study purposes. You’ll also get Guitar Pro files so that you can play, loop and/or slow down the tab and notation as you work through the lessons. Plus, Ariane generously includes all of the rhythm tracks for you to work with on your own. Grab your bass and let’s get our pentatonic groove on with Pentatonic Playground for Bass by Ariane Cap! Use the link in the sidebar to pick up a copy of Pentatonic Playground for Bass. Psst – mark your calendars! On Monday, September 26th I am doing a seminar over at scottsbasslessons.com I am super stoked Scott has invited me! 3PM Pacific. 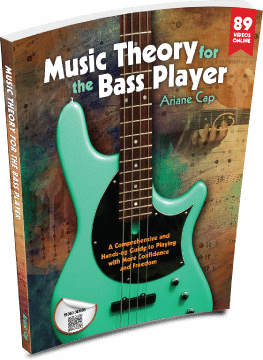 I will be talking about Music Theory for the Bass Player… Bring your questions! Girl you HAVE been busy. Last year at the NAMM, this was an idea, you had in your head. And in the course of a few months, here it all is and it’s fantastic! Can’t wait to see you here in LA. I want an autographed copy. You are an inspiration! See you at Bass Player Live. Sharon, right back at you! I am SO GLAD you and Lynne Davis waited up for me that day 🙂 I see you soon! Tim, thank you for writing, that’s awesome to hear, and thanks for checking out my seminars over at scottsbasslessons.com and in the academy. I just bought this course… working on the Hexagon Major stuff… I like the course materials… easy to follow, and the printouts are great. Forgot to say… I’m also an SBL member (which is where I originally heard of Ariane Cap). Eric, very cool! High Five and enjoy!! Thanks for your comment!